In a blender, combine the milk, flour, sugar, salt, eggs and the 3 tablespoons of melted butter and blend until smooth. Let the batter stand at room temperature for 15 minutes. Heat a 7-inch nonstick skillet and brush lightly with butter. Add 1/4 cup of the batter and, working very quickly, tilt the skillet to coat the bottom with the batter; pour any excess batter back into the blender. Cook the crêpe over moderate heat until browned around the edge, about 45 seconds. Flip the crêpe and cook until brown dots appear on the bottom, about 15 seconds longer. Transfer the crêpe to a baking sheet lined with parchment paper. Continue making crêpes with the remaining batter, brushing the pan with melted butter as necessary. You should have about 13 crêpes; set aside the 8 nicest ones and reserve the rest for another dish. In a large skillet, heat the 1/4 cup of oil until shimmering. Add the onion, garlic and ginger and cook over moderately high heat, stirring, until softened and lightly browned, about 5 minutes. Add the minced shrimp and cook, stirring, just until pink, about 1 minute. Add the coriander, turmeric and cayenne and cook, stirring, until the shrimp is cooked through and the spices are fragrant, about 1 minute longer. Scrape the mixture into a bowl and let cool slightly. Stir in the cilantro and season with salt. Arrange the 8 crêpes on a work surface. Mound the shrimp filling in the center of each crêpe. Fold in the sides and roll up each crêpe like a burrito to enclose the filling; seal the edges with a little of the beaten eggs. Put the remaining beaten eggs and the bread crumbs in 2 separate pie plates. Dip the stuffed crêpes into the egg and then roll in the bread crumbs, pressing lightly to help the crumbs adhere. In a medium skillet, heat 1/2 inch of canola oil to 350°. Add the stuffed crêpes in a single layer and fry over high heat, turning once, until golden and crisp, about 3 minutes. 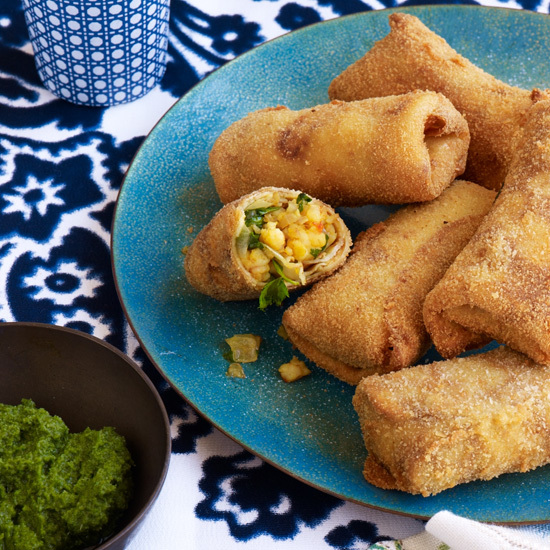 Transfer the stuffed crêpes to paper towels to drain, then serve right away with cilantro and tamarind chutneys. These airy crêpes are ideal with an equally vibrant sparkling winetry a sparkling rosé, an up-and-coming category. Consider a Prosecco from Italy: NV Riondo Pink Spago Raboso.